Contrast agents are used to image tissues and structures that are not normally seen, or not seen very well. Intravenous contrast agents are used to enhance organs and visualize blood vessels. Oral contrast agents are used to visualize the digestive tract. Please let us know if you have any allergies or kidney or liver problems. Most abdominal scans require the patient to drink a barium sulfate oral contrast mixture. This mixture is flavored and not at all unpleasant. Oral contrast highlights the stomach and upper intestine providing the radiologist with a detailed image for review. What if I am allergic to X-ray dye? If you have had a reaction to X-ray dye in the past, have allergy to shellfish or iodine, or any anaphalxis reactions please let us know. Please consult your primary physician or our staff Radiologist for details. You should continue your medicines as usual and drink extra juices prior to your exam in case you are not able to eat in a timely fashion. If you take oral diabetes medications, you may take it the day of your exam, but if you receive IV X-ray dye, you need to discontinue its use for 48 hours after the exam and have blood work before resuming your medication. You should let your primary physician be aware of this. Patients may be asked to wear a gown for some scans. In addition, removal of glasses, jewelry, dentures, hearing aids, or anything else that could interfere with the scan may be required. Do I have to hold still during the whole exam? 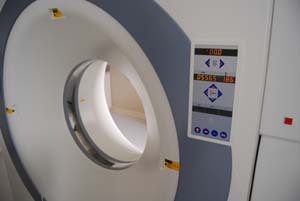 You will need to hold as still as possible; patient motion can compromise image quality. We may ask you to hold your breath at certain times to reduce breathing motion. Your doctor should receive a written report in 1 to 2 business days. If requested by your physician, a report can be called to him/her the day of the exam. You can get the results from your doctor.